Deacetylase Inhibitor Cocktail is a synergistic combination of chemicals designed to preserve the acetylation state of proteins. Lysine acetylation is an important post-translational modification that can affect protein transcription, cell cycle, and signal transduction pathways. The balance between acetyltransferase enzymes and deacetylase enzymes affects chromatin condensation, transcription factor activity and protein aggregation and is of significant interest to researchers. Deacetylation Inhibition Cocktail is a useful tool for investigating these important biological pathways. 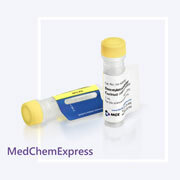 MedChemExpress Deacetylase Inhibitor Cocktail (100× in 70% DMSO) is provided as 1 mL vial. Each vial contains 1 mL deacetylase inhibitor cocktail solubilized in 70% DMSO with the following components: Trichostatin A (40 μM), EX-527 (1 mM), Nicotinamide (400 mM), and Sodium Butyrate (200 mM). Each component has specific inhibitory properties. Trichostatin A acts to inhibit class I/II HDAC. EX-527 inhibits SIRT. Nicotinamide acts against class III HDAC. Sodium Butyrate acts against class I/II HDAC. Deacetylase Inhibitor Cocktail (100× in 70% DMSO) can be stored at -20°C for 12 months. 1. 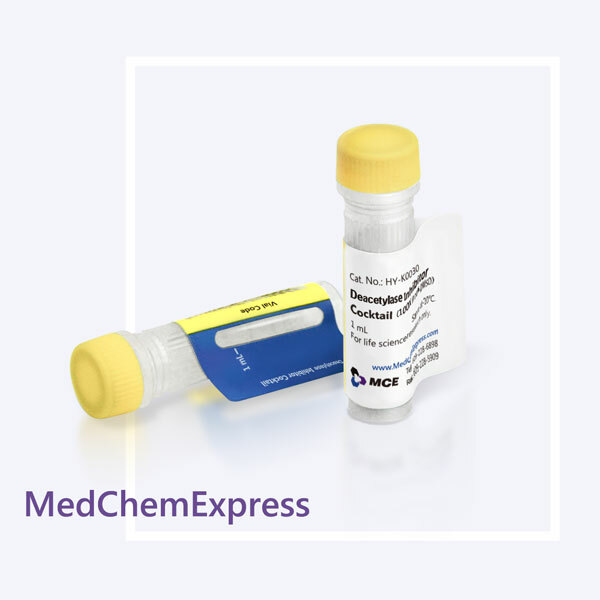 This product can be applied in Western Blotting, Flow Cytometry, and ImmunoFluorescence and etc. 2. Thaw at room temperature, add at 1:100 (v/v) dilution to culture media, recommended incubation times of 16-48 hours, before assaying. 3. One tube of Protease Inhibitor Cocktail is recommended for inhibition of proteases present in cell for Western Blotting.